February | 2009 | Two cultures, one mind. City Link delivered my Acer at 7:15 this morning. Really can’t complain about being woken for it. Beautifully packaged Acer Aspire One was a doddle to set up, entered my password, turned the wi fi on, connected to the wireless network. And it turned itself off. Turned on again, only got as far as the menu screen itself. Tried without the battery, checked the BIOS settings – I’ve clearly been lulled into reliability by the cult of Mac. Nothing. Am I upset? No. Am I frustrated – a little, though these things happen. Lessons for next time include buying my laptot from a shop (easy to return), and don’t always rely on the name (everyone was telling me how reliable Acer’s were). I’m looking at alternatives, but nor for a while yet – the prices are still heading downwards, so am sure that there will be a small cheap computer for me. The least impulsive purchase in the world? Well, it’s taken me nearly a year from when I first decided to buy a laptot, but I’ve finally (finally!) ordered one, and Royal Mail willing it will be with me by tomorrow. I’ve debated long and hard with myself, but I’ve finally bought an up-specced Acer Aspire One, with 1 Gig memory and a whopping 160 Gb Hard Disc. It doesn’t quite fall into the SCC (Small Cheap Computer) category, though is is still a third of the cost of my last MacBook. Let’s just hope that Amazon do their job and get it to me by tomorrow as promised – confidence is not high as the last two times I’ve paid for express delivery it hasn’t arrived at the time scheduled. Why the AA1? I was really, really tempted by the HP 2133, which would have been a fair bit cheaper and generally had a better review of build quality, but support seems limited to a couple of ‘fan’ sites, and there seems to be concern with performance and overheating. There’s loads of info out there for the AA1, as well as lots of different OS’s. The final straw when I saw that a student today was running Vista premium with no problems on his AA1, and I was able to hold it and feel how genuinely light and portable it is. Myself, I don’t see this as a MacBook replacement, the screen size and ease of use will be hard to beat, but with this, I think I’ve got every computing niché covered, and I’ll never need to buy another computer again. It came as a real surprise to me that it had been six days since I last blogged. I don’t think (illness and holidays permitting) I’ve ever had such a long gap. One of the reasons I think is that I’ve increasingly started using Twitter for short, instant updates to friends and family about what I’m doing, and a combination of Twitter/Facebook to keep in touch with the same friends/families. There’s also a large amount of uncertainty at work at the moment, and whilst I’m reflecting on a lot of what’s happening personally, it’s not really appropriate to talk about his in a public space. I guess that to some extent this is constraining what I feel I can talk about. I’m also (relatively) skint, meaning that my gadget purchasing has been curbed recently. I still really really want a laptot, and went scurrying off to Asda today as they had huge stocks of the Acer Aspire One for £150, but nowhere local to me I’m afraid. There will be other bargains I’m sure, though there’s definitely a sweet spot price point for netbooks of around £200. The more I think about it, the more I am sure I would find such a product useful, though my ever reliable and trust MacBook still does me stirling service. I’m still persuaded to think that Apple are looking at launching a netbook, in 2008 20% of all laptop sales were in the sub 10″ screen market and a company as savvy as Apple can’t continue to ignore this area. In addition, the ‘cheap’ MacBook has become less and less affordable… the new aluminium macbook is £929 in it’s cheapest guise (though the ‘classic’ white MacBook is now available for £719, and with a much improved spec as of early Jan 2009). It doesn’t take a marketing mind to consider that Apple could gain a lot of Kudos by creating a ‘credit cruch’ laptop. If I really want Apple to launch this product, then it’s simple, all I have to do is to buy a Linux based laptop and wait a couple of weeks. They upped the spec of my MacBook within a couple of months of purchase, and Big Mac was out of date within less than a month of purchase, so it’s a sure-fire bet that after I make a purchase, Apple will do the deed. Next week is looking busy, with a lot of teaching and exam boards, which I’m not sure I’ll be able to make all of due to teaching and project commitments. Ah well, I can only do my best, short of cloning myself I guess. Through LifeHacker I’m trying a new productivity system (used to be called ‘to do lists’ in my day) called Autofocus. It’s been created by Mark Forster, who I admire and have used his techniques before. Autofocus is clearly described here, and I won’t repeat the details, but I will explain why the system seems to work for me. There’s no prioritising or categorising of the items on the ‘to do’ list. As Mark has ‘twittered’, you can put ‘sharpen pencil’ or ‘take over the world’ as an item in Autofocus, and they are both valid. There’s a good focus on empathy, you do what you feel like doing at that time on your to-do list. This works well with my frame of mind, certainly at work. I can pick what I want to do. If I don’t complete the item, I cross it off the list and add it to the bottom. There’s an element of ‘drop out’, if you reach the end of a page, and none of the items appeal to you then you highlight them but don’t carry them forward onto the next page just yet. Of course some items will have to appear on your list again (we all do things we don’t like to do), but at least this way you get page ‘closure’. Some aspects of this are similar to a time management technique I used to use years ago, when uncompleted tasks were carried forward to the next week, and so on. The problem was that I was always carrying the same tasks forward, and there was no potential to stop and start a task as there is with Autofocus. It doesn’t try to combine home/work/personal into a single list, it clearly states that they should be kept separate. Whilst Mark Forster recommends separate books, once I’m set up with my ‘proper’ book (see below) I may just use the back of my new book for ‘stuff’ outside work. Finally, I have another excuse to buy another moleskine notebook, which can’t be bad! At the moment I’m using an emergency notebook, but looking forward to transferring my new Autofocus list into the new one. One thing that keeping a list like this does is demonstrate to yourself how productive (or otherwise) you have been in the day. Even with a heavy teaching day yesterday I managed to get four fairly sizeable chunks off my list. Admittedly though, I still have 15 outstanding items! (14 now, as blogging about Autofocus was on my list!). A video of ‘how it works’ is below. The first part of this week was spent at the NTI Birmingham, part of my university, but a new place for me. I sat the ‘Leopard 101’ examination, which is the core course and qualification for all Apple certification programmes. I can confirm that I am now an Apple Certified Support Professional. The results are all available online, very clever copied below. I’m really pleased with this, and the mark (the pass mark needed was 73%). I didn’t really have a chance to examine the marks too closely, and it came as little surprise that my weakest areas are network configuration and network service acces. I’m still thinking about whether to take this further, the next qualification is Apple Certified Technical Coordinator. I can now officially use an Apple logo on this blog, as soon as I have them in the right format I will do. The training materials were excellent, as were the facilities, though the machines we were using (Mac Pro’s with dual core G5’s) were a little slow by today’s standards they did have 4.5 Gig of memory, making them fly. “Arpanet was designed to withstand a nuclear attack”. No! No! No! I’ve been marking first year student scripts for a module which I no longer teach on. One question asks about the origins of the Arpanet. I’ve nearly run out of red ink crossing out a sentence similar to the one quoted above. I’ve just checked the Internet, and I’m really pleased that this urban myth is slowly dying out, find it only in an old .pdf file from 2004. Still, it’s ingrained in student conciousness. My information on the origins of the Internet comes from “When Wizards Stay Up Late“, a book I came across in 1999 and is the definitive guide to all things early Internet. It’s very readable, and shows a little of the personality behind the people. Why wouldn’t the Arpanet survive a nuclear attack on the USA? An electromagnetic pulse, which would fry most solid state electronics is an essential element of a nuclear bomb, and was used by Arthuer C. Clarke in his final novel. This would fry all electronic communication across a very wide area, and even a resilient network such as the fledgling Arpanet (and to some extent the Internet now) would struggle to survive (see how whole countries can suffer a real degredation of service if a single undersea cable is cut for example). Please, go read the book, or even the website above for more info on this, and this excellent book. I’m still here, but really busy at the moment. Any students looking for me around campus, sorry! Please email me, and I can make appointments for Friday. 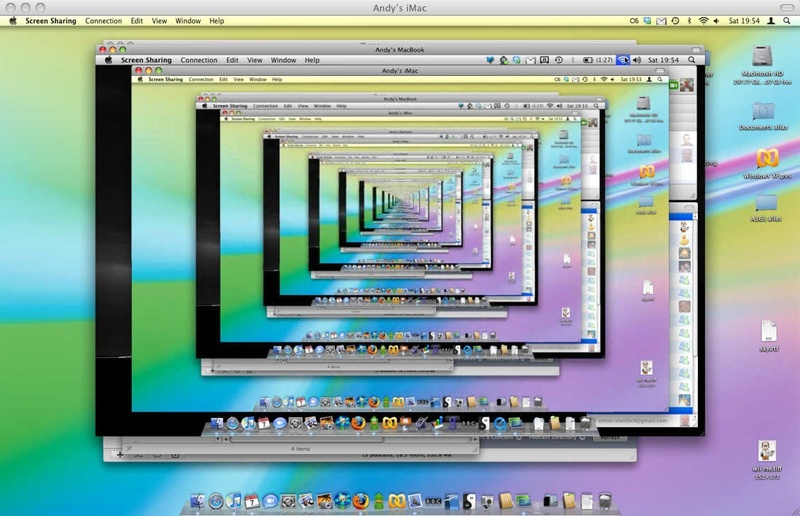 What happens if you use screen sharing to take control of another mac, and then within screen sharing use screen sharing to take control of your original mac? Let’s do it and find out! I’ve talked in the past about outsourcing parts of my life – the idea that outsourcing is something that you could do yourself, but instead choose to get someone else to do it for you. I already have two ladies to ‘do‘ for me, and I’ve now moved a little closer to my idea of perfection of only going to a supermarket once a week. For the first time since I moved away from home, I’m having milk delivered three times a week. This is going ‘OK’, though I do seem to be saying ‘there’s a cow in this fridge’ an awful lot. It was sold to me on a doorstep delivery as being local, but I’m not quite sure that I’ve got the quantities right just yet. And I’ve just ordered my first organic veg box to be delivered on Friday. I was put onto this by a friend who has twittered about his own veg box delivery. A good way for me to get my fruit and veg, and surprisingly affordable, though the quantity/quality has yet to be taken into account. This acted as a timely reminder to tell the world that I’m once again active on Twitter, and using it to keep up with friends (and some ‘family’). My Facebook ‘what are you doing now’ is also being updated from it, making me appear much more active on FB too. Maybe there is something to this web 2.0 lark! There’s a little-known iPod touch command (which I suspect also works on iPhone). Simply press the Home button twice in succession, regardless of the application you’re in, and a small pop-up appears. It simply tells you the Artist, Song and Albim, and a fast forward/rewind button, but of most interest to iPod Touch first generation a volume control. This is less useful for second gen owners of course. Finally, there’s a button which takes you to the iPod ‘music’ app. This is really useful I think, and guess may not be known by all users – it’s not exactly an intuitive option, though I’m sure it’s somewhere in the online documentation.